The dogs here at SSD are an extremely talented bunch. Not only can they do complex Service Dog tasks but they've now become the world famous Doggie Da Vincis, featured in newspapers, magazines, television, and even National Geographic TV's "Dog Genius" program that will be airing in late 2007! They spent months perfecting their skills of steadily holding the brush and learning how to paint on paper and canvas and are now showing their works to the public to lend a helping paw in raising money for their education and care. Made with non-toxic paints to ensure the dogs' safety, these beautiful masterpieces have hung in nationally renowned galleries and would easily grace the finest of homes or businesses. Each of these incredible one of a kind muttsterpieces are entirely made by the dogs themselves, including placing paw to painting to create unique PAWtographs on every one of their compositions. The only human touch is their name signatures, which was done by their painting assistant, Mary. The guys are talented, but they haven't quite mastered how to spell yet. Give them time, though and I'm sure they'll someday be able to do that too! We are offering the originals and numbered prints of each of the pieces as well as a collection of notecards of their artwork. By donating to their cause, you will not only be helping them but will also be helping their future partners in need. With your generous support, we can make a difference! Please make one of their lovely paintings a part of your art collection! We hope that you enjoy browsing the gallery. Make sure to also check out the Shore Service Dogs' YouTube videos of them creating their gorgeous one of a kind paintings and performing their Serivce Dog tasks. We will be updating both this page and the YouTube site along the way with any new pieces they create and tasks they perform so please make sure to return often! and make sure to check back often to see new muttsterpieces! the paintings and videos load. Please click here to learn more about how to fix this issue. NOTE: Basic shipping for shipments TO LOCATIONS WITHIN THE LOWER 48 STATES IN THE U.S. is included with gift items hilighted in yellow. All $35 and under donation level gift items will be shipped via U.S. Postal Service First Class Mail Ground. All $50 to $250 donation level gift items will be shipped via U.S. Postal Service Priority Mail. For faster shipping, please contact info@ShoreServiceDogs.com for options and shipping prices. For all HAWAII, ALASKA, U.S. TERRITORIES, OR INTERNATIONAL SHIPMENTS and ORIGINAL ARTWORK SHIPMENTS contact info@ShoreServiceDogs.com for shipping charges to your address. As we're a small organization and our #1 responsibility is training these wonderful dogs to help others, please allow for a possible 4 - 8 week processing and delivery time (just to be on the safe side). We will attempt to accomodate requests for delivery if needed sooner, but please understand that while we wish we could, we won't be able to do everything for everyone. We appreciate your support and understanding! Handmade by Shore Service Dogs. Available in XSmall, Small, Medium, Large, & XLarge in a variety of fabric patterns and colors. Handmade by Shore Service Dogs. Available in Small, Medium, Large, & XLarge in either blue flames or orange flames. Pet's name is handscripted in gold on a black ribbon background. Handmade by Shore Service Dogs. Available in Large, & XLarge in black w/ gold dragons and red flames. Pet's name is handscripted in gold over a silver pawprint on a black background bordered by red ribbon. $25 5x7 (8x10 outside dimension) MATTED Numbered Print on Heavy Weight Paper. 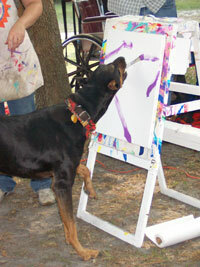 $35 DVD of Shore Service Dogs in action performing Service Dog tasks and painting muttserpieces. $50 5x7 FRAMED Numbered Print on Heavy Weight Paper w/snapshot of the Service Dog painting that artwork piece, on the back. $100 8x10 (11x14 outside dimension) MATTED Numbered Print on Heavy Weight Paper w/snapshot of the Service Dog painting that artwork piece, on the back. $250 8x10 (11x14 outside dimension) FRAMED Numbered Print on Heavy Weight Paper w/DVD of the Service Dog painting that artwork piece and a snapshot of the Service Dog painting that artwork piece, on the back. $325 11x15 ORIGINAL Acrylic on Heavy Weight Acid Free Artist's paper. $350 11x15 ORIGINAL Acrylic on Heavy Weight Acid Free Artist's paper w/DVD of the Service Dog painting that artwork piece and a snapshot of the Service Dog painting that artwork piece, on the back. $400 12x16 ORIGINAL Acrylic on Canvas Board w/DVD of the Service Dog painting that artwork piece and a snapshot of the Service Dog painting that artwork piece, on the back. $500 16x20 ORIGINAL Acrylic on Canvas Board w/DVD of the Service Dog painting that artwork piece and a snapshot of the Service Dog painting that artwork piece, on the back. $750 16x20 ORIGINAL Acrylic on Stretched Canvas w/DVD of the Service Dog painting that artwork piece and a snapshot of the Service Dog painting that artwork piece, on the back.